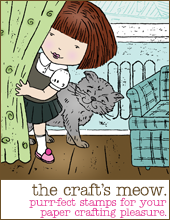 Welcome to The Craft's Meow June release blog hop! Four fabulous new sets are now available in The Craft's Meow store, they include - Beautiful Rose, Kindred Spirits, Sweet Memories and Fancy Flourishes (June free gift with $50 purchase). You should have arrived here from Angi's blog but if you got lost anywhere along the way just visit the TCM blog for the full list of participants. 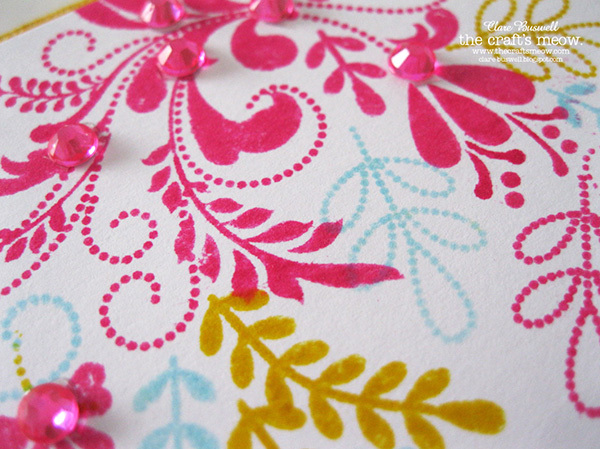 For my first card I used the new Kindred Spirits stamp set to stamp a bright and cheery background paper. I used Distress Inks (Mustard Seed, Mowed Lawn, Picked Raspberry, Ripe Persimmon and Salty Ocean) to stamp the background. 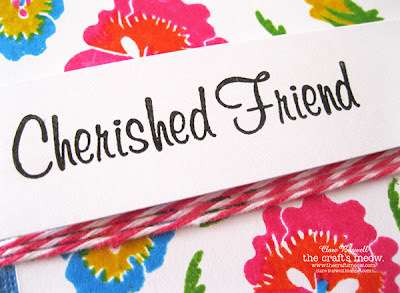 The sentiment is also from the new Kindred Spirit stamp set. The Pink Sorbet Twine is from SRM Stickers and the blue cardstock is from Core'dinations Brights collection. For my second card I used the new Fancy Flourishes stamp set. I love all the little elements in this set, this was so much fun to stamp, I used Distress Inks (Mustard Seed, Picked Raspberry and Tumbled Glass) again and the sentiment is from the same set, colored with Tumbled Glass Distress Marker. The yellow cardstock is from Core'dinations Brights collection. To add a little sparkle to the flourish I popped on some hot pick gems. Next up on the hop is the talented Deborah. Don't forget to leave a comment on each of the DT's blogs and on the TCM blog to be eligible to WIN all 4 new sets from the June release. The deadline to comment is 8:00pm PDT, Sunday June 23rd. Thanks for dropping by and enjoy the rest of the hop! Both cards are stunning, love them!! I love this! So beautifully stamped and elegant...great job! Both your cards are bright and happy :) love the colors you chose. These stamps look amazing. TFS! Your blooms are so bright and cheery, but it's the flourish that's really growing on me. Love the multi-colored image. Sorry if I have repeated comments but my internet it a little funny tonight. Too much unseasonal rain is playing havoc with the copper lines in the ground I suspect. Anyway I think your cards are great. I especially love the bright background you have produced with the kindred spirits. Oh Clare, your cards are beautiful! I love the bright colors! Loving the new stamp sets. Beautiful cards. Love the bright cheerful colors and I love the new stamp sets. Very Pretty card!Love the colors,so bright!!! Pretty cards. Love the bright, happy colors. Very pretty and colorful cards. The cards are lovely. 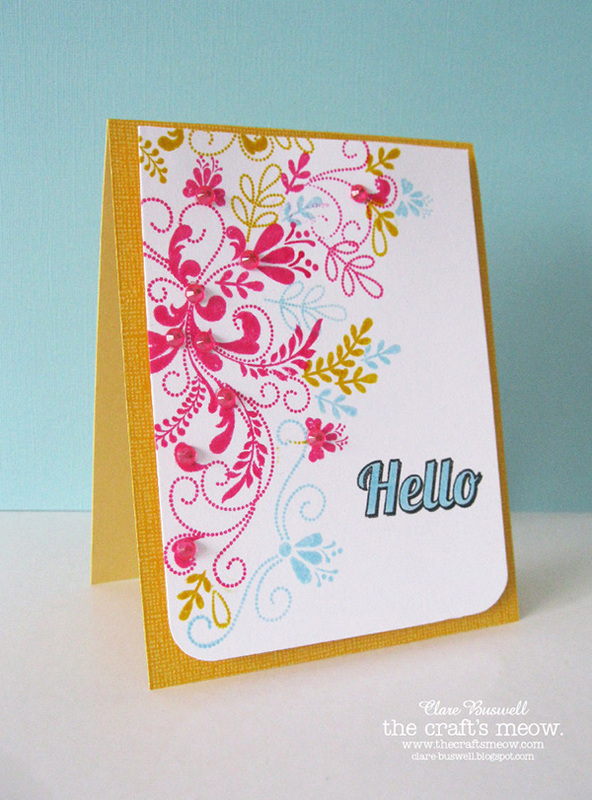 Love the paper choice in the first card and the flourish stamping in the second. Great job. Love your bright cheerful colors! Love that pansy stamp! Such bright and vibrant cards - they make me smile!! Love that beautiful flourish stamp set!! I love all of the gorgeous colors you used, Clare!! Great job! So very bright and lively! The colors you used are wonderful! TFS! Great job on your cards. I like that you used Distress Inks to stamp your backgrounds...they are so beautiful. Great flowers and flourishes. Both of your cards are wonderful. Love your wonderfully happy colors and the beads. Oh my goodness!! These are absolutely breathtaking! Such gorgeous background stamping. Love the colors you chose!!! Beautiful cards. Can't choose which one I love more. Wonderful use of the different stamps...I love the flourishes on the second. Fantastic cards. Love the bright colors. Beautiful stamping...I thought that was patterned paper at first glance. Very pretty. I love how the stamps are framing the side of the card! Lovely and bright. Fabulous card. Thanks. Wonderful cards! Love the Cherished friend card, beautiful colors and stamping!! Also love the gems on the second card. Thanks for sharing. Love both your cards. Great stamp sets too. Beautiful cards. The background stamping is amazing. Wonderful color choices. I love your second card: those flourishes are just so beautiful!! Lovely cards. I like how you combined the Fancy Flourish stamps to create a beautiful composite design. 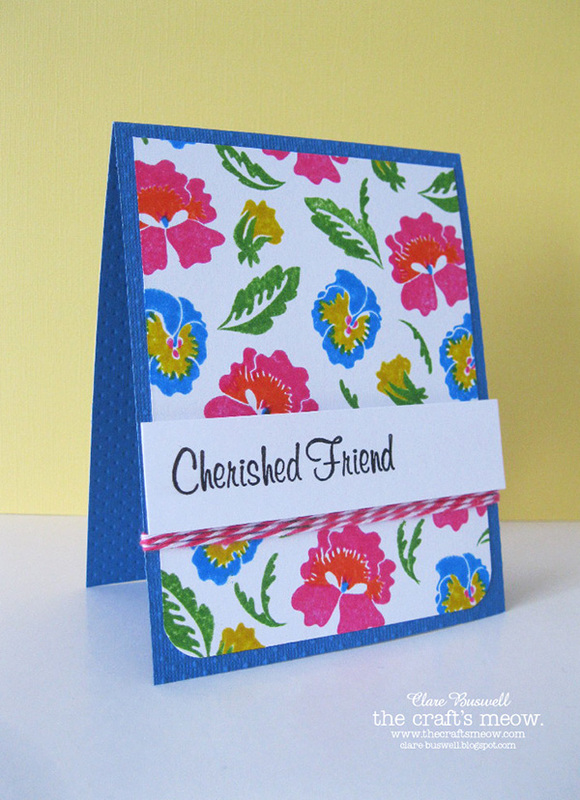 What gorgeous bright colours on these cards! They have given me a little lift from dreary winter here in Australia! Love the colors on both cards. It's fun to make your own design by your color choices and placement of stamps. These new stamp set would make it easy to create something beautiful very quickly.